Casa Capricho is in Puerto del Carmen. It is a very comfortable, cozy, and you´ll love it because it is a few meters from the Avenida de las Playas, Playa Grande and all the leisure of the area. It's perfect for days at the beach & fun. Wi-Fi included. The apartment has 2 bedrooms, one with a double bed and the other with 2 single beds. Bathroom with shower equipped with hair dryer, magnifying mirror and high quality amenities (gel / shampoo and moisturizing dispenser), living room with 47 inch screen, sat tv with english and europe channels, Wi-Fi, dining-area and well equipped kitchen. It also has a terrace with furniture and outdoor shower. Puerto del Carmen is the main tourist area of ​​Lanzarote. Offers more than 6 km of beaches with calm waters, ideal for scuba diving. In parallel to the sea you have an avenue with all kinds of tourist services, shops, cafes and restaurants. Everything about this house is great - especially the location. 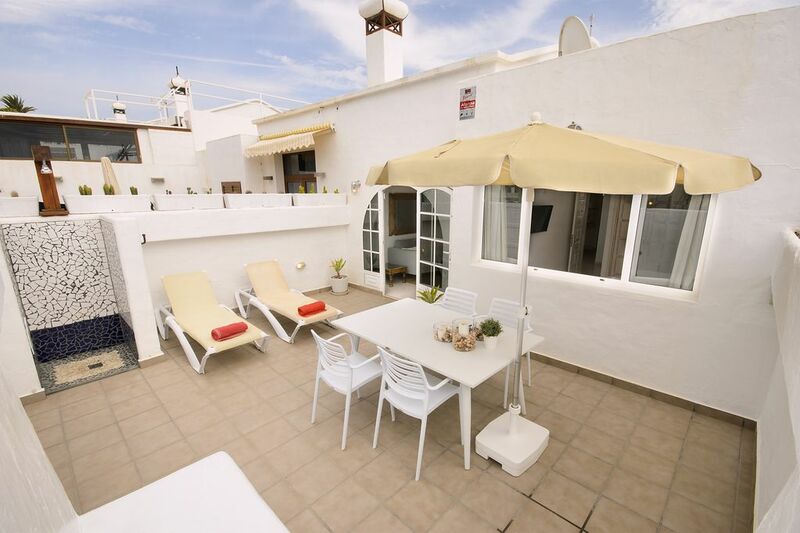 It is literally minutes to the beach, the shops and the promenade while still being quiet and peaceful. It is beautifully presented, spotlessly clean with plenty of linen, comfortable seating and two bedrooms. We loved it !